On a recent birding outing around Forest Park the birds had made themselves scarce but the bugs were out in force. 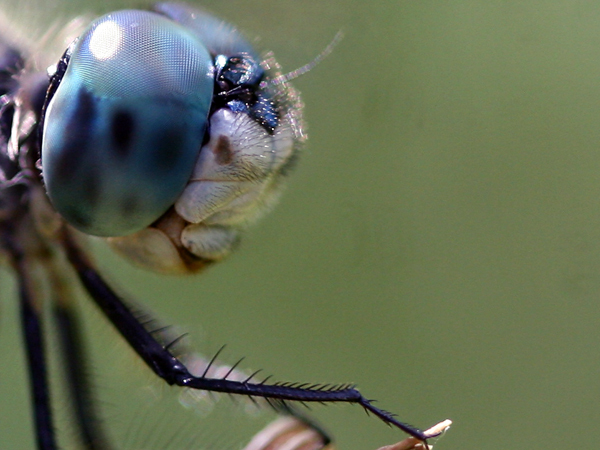 So I made lemonade from lemons (maybe not the best metaphor when dealing with bugs) and focused my camera on the six-legged set, in particular on a Blue Dasher (Pachydiplax longipennis). This particular dragonfly was kind enough to sit still, first on a dead stalk and then on the edge of a leaf. I photographed him (and it is a him, one can tell by the two black streaks on the hind wings near their base) from every angle I could think of, and then did it again. 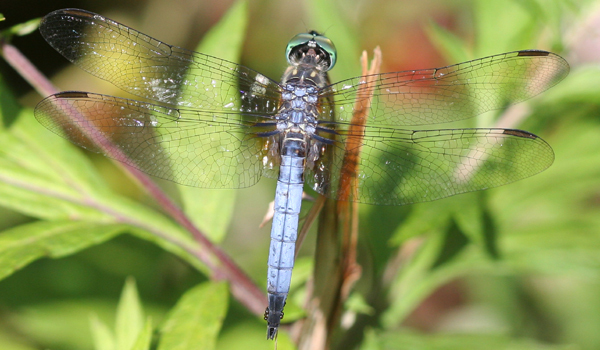 But how did I know that it is a Blue Dasher? Well, the dark-tipped, pale blue abdomen was the first clue, followed by the white face and greenish eyes. When I got close enough, the black and yellow striped thorax was the final clue. By the way, the black round things that are visible on the back end of the thorax are some kind of mite, and this dragonfly had them there and all over the underside of his tail. That can’t be comfortable! Blue Dashers have a long flight season, and are found in southern Canada, across the entire contintental United States except for the north-central area of the country, and, presumably, south into Mexico. According to couple of sources online, in the spring Blue Dashers are larger and those that emerge later in the season are smaller. 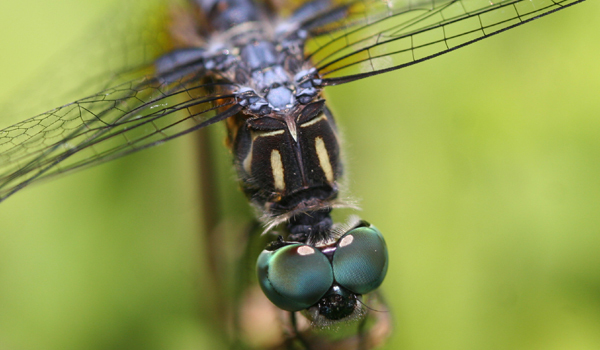 And, despite the Latin “longipennis” in the scientific name these dragonflies are not particularly long-winged. So get out there looking for Blue Dashers: you can find them wherever there is still water. Enjoy! That was one cooperative dragonfly. Really nice series of pictures and commentary. The last shot is especially cool! Help Queens Birders Save the Forest Park Feeders! Is It So Hard To Understand Why Birders and Wildlife Conservationists Don’t Buy the Duck Stamp?